Our trip has been a wonderful mix of HI programs and visiting different areas of Haiti. 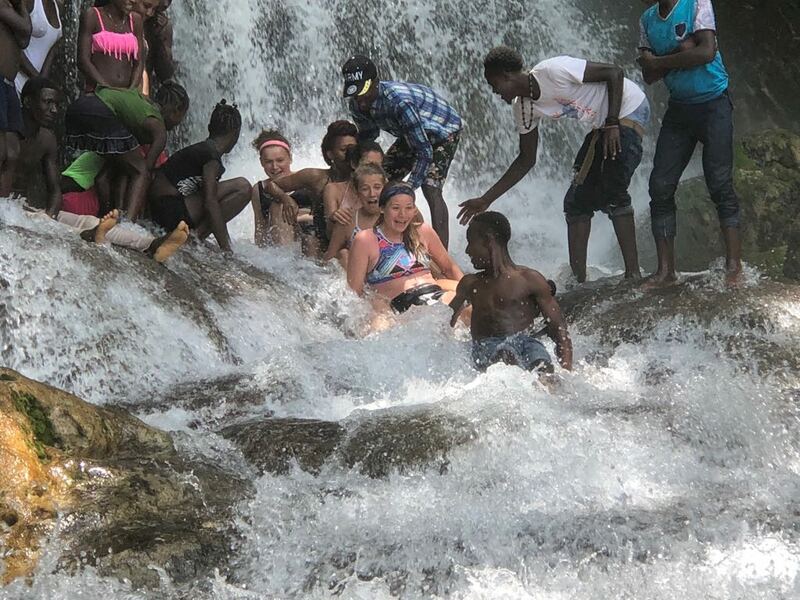 Today we drove to Saut D'eau, a beautiful waterfall not too far from Port-au-Prince. Though only 10 miles as the crow flies from our guest house to the waterfall, it took us 2 hours to get there because we went the long way to stay on paved roads. When we arrived we walked down several flights of stairs to get to the bottom of the waterfall. We couldn't tell how big it was until we got into the water and started hiking back. There were local boys there who helped us to ensure we didn't fall as we hiked. There are actually three falls there - 2 are quite tall, perhaps falling 40 feet into the pool that cascades down. We watched the other people that were at the waterfall, slide down the cascade like a slide and we couldn't resist and had to try it. We went by ourselves and soon our new Haitian friends joined in and we made a train. It was fun, but a bit rough on the bum. We dried off and then headed back to HI. When we got there, the younger kids were doing English lessons and the teacher said we could join in. We were a distraction to the kids so the teacher, Lanot, got us involved. We taught the kids a few phrases in English and then they taught us several phrases in Creole. They laughed at our awful accents and it was great to have them share their knowledge with us.